Got 2 best paper awards, in National conference on “Sustainable Engineering and Management” held at The Oxford College of Engineering, Bangalore 26-27th May 2017. Got 2 best paper awards, in 3rd national conference on “Recent Innovation on Science and Engineering” held at PESIT-Bangalore South Campus, Bangalore 6th May 2017. Got 2 best paper awards, in 2nd national conference on “Recent Innovation on Science and Engineering” held at PESIT-Bangalore South Campus, Bangalore 2nd May 2016. BEST POSTER AWARD, for the paper presentation in the in the National conference on Recent Advances and Applied Science, held at AMC Engineering College, Bangalore on 25th April 2016. Got 2 best paper awards, in national conference on “Recent Innovation on Science and Engineering” held at PESIT-Bangalore South Campus, Bangalore 2nd May 2015. Got first 1st prize for paper presentation in two days national conference on Innovative Research Materials held at Christ College, Bangalore, November 14-15th 2014. Got Second prize in 3rd International Conference on Recent Advances in Material Processing Technology (RAMPT’13) held at Kovilpatti, Tamilnadu 6-8th January, 2013. Got 2 best paper awards, for papers presented at the Knowledge Utsav, held at Jain University, Bangalore, 28th August 2010. “Production of Biodiesel from Algae”, a funded research project, Sponsored by KSCST, Bangalore. Mentored Undergraduate students, Department of Mechanical Engineering, GM Institute of Technology, Davanagere. • Synthesis of Novel Macrocyclic Ligands and their metal Complexes. • Synthesis of Conducting Polymer Composites for better Materials Properties. • Synthesis of free standing thin films of Conducting Polymer Nano Composites. • Synthesis and Characterization (SEM, XRD, IR, DSC/TGA, UV-Visible, NMR, and ESR) of Coordination metal Complexes and Conducting Polymer Nano Composites. • Study of Antimicrobial activities of Coordination Metal Complexes. • Beneficiation of Fly Ash at low and Microwave Frequency region. • Low Frequency Conductivity, Impedance and Dielectric studies of Polymer Composites. The ever increasing application of metal complexes, in various fields of science is the driving force for selecting this topic for my Ph.D.
During Ph.D. work, I have synthesized the Novel macrocyclic ligands of symmetric and asymmetric azines by using Benzophenone hydrazones and their coordination metal Complexes of first row transition metal ions. Prepared ligands and complexes were characterized by using techniques such as UV-Visible, IR, NMR, ESR, Magnetic Susceptibility Measurement and XRD. Detailed studies of their antimicrobial and electrical properties such as DC properties were investigated. The new results obtained by these metal complexes were important outcomes of the research work. The entire Ph.D work in parts has been published in different journals of International and national reputes. To design a diagnostic tool using piezoelectric sensor with microcontroller (Funding Agency- Government of Karnataka Vision Group on Science and Technology: Cost 40,000/-). 13 years’ experience in Synthesis of Novel Macrocyclic Ligands and Complexes, Characterization and Antimicrobial Studies on Coordination Metal Complexes. 8 years’ experience in Synthesis, Characterization and Transport Properties of Polyaniline and Inorganic Oxide Composites. Synthesis and Characterization (SEM, XRD, IR, DSC/TGA, UV-Visible, NMR, and ESR) of Coordination Metal Complexes also Composites of Conducting Polymer and studies involving their Electric, Magnetic, Microwave and Sensor properties. 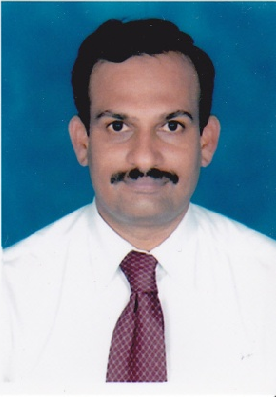 Ph.D is awarded to Mr Doopadahalli Siddalingaswamy, entitled “SYNTHESIS, CHARACTERIZATION, TRANSPORT PROPERTIES OF CONDUCTING POLYMER COMPOSITES AND ITS APPLICATIONS” on 28-12-2015, from chemistry Research center, PESIT, Bangalore South Campus. Collaborating with Huh Do Sung Department of Chemistry and Materials Science Engineering, Inje University, South Korea on conducting polymer composites. Since March 2009. 1. B P Prasanna1, D N Avadhani, H B Muralidhara, K Chaitra, Vinny Rose Thomas, M Revanasiddappa and N Kathyayini “Synthesis of polyaniline/ZrO2 nanocomposites and their performance in AC conductivity and electrochemical supercapacitance” Bulletin of Materials Science pp 1-9, 2016, DOI 10.1007/s12034-016-1196-9. 2. Jyoti C Ajbani, D Smita Revankar, M. Revanasiddappa, Veerabhadra Swamy and S. Shankar “Microwave Synthesis, Spectroscopic, Thermal and Biological Studies of Some Transition Metal Complexes Containing Heterocyclic Ligand” Int. J. Chem. Sci. : 13(4), 2015, 1673-1692. 3. K. A. Vijayalakshmi, K. Vanitha, M. Revanasiddappa and S. C. Raghavendra “Synthesis and conductivity study on polyaniline/BaFe/silver (PANI+BaFe+Ag) nanocomposite with plasma treatment” Materials Technology: Advanced Performance Materials VOL 00 NO 0 2015. 4. Nithin Kumar N, Siddesh Chincholi, Preran R Hegde, Shivagiri S Y, Revanasiddappa M and Azharuddin Kazi “EXPERIMENTAL RESEARCH ON HARDNESS and FLEXURAL PROPERTIES OF TEAK WOOD POWDER AND FLY ASH REINFORCEMENT WITH EPOXY” “INTERNATIONAL JOURNAL OF CURRENT ENGINEERING AND SCIENTIFIC RESEARCH”(IJCERS), ISSN: 2393-8374, (ONLINE): 2394-2397, VOLUME-2, ISSUE-11, 2015. 5. Smita, Revankar D, Jyothi, C Ajbani, Revanasiddappa, M, Virabhadraswamy, M “Microwave assisted synthesis, structural elucidation and biological significance of Riluzole derived 2-hydroxy naphthaldehyde and its transition metal chelates” International journal of applied chemistry, (11), 3, pp 371-387, 2015. 6. S. Shrinivas, M. Revanasiddappa “Analytical Stability Indicative Method Development and Validation by High Pressure Liquid Chromatography for Assay in Ciprofloxacin hydrochloride Drug Substances” American Journal of Analytical Chemistry, 2015, 6, 719-730. http://www.scirp.org/journal/ajac http://dx.doi.org/10.4236/ajac.2015.69069. 7. S. Shrinivas, M. Revanasiddappa “DEVELOPMENT AND VALIDATION OF A STABILITY INDICATING RP-HPLC METHOD FOR ASSAY DETERMINATION OF METHYLPARABEN, PROPYLPARABEN, POTASSIUM SORBATE AND SENNOSIDES” World Journal of Pharmaceutical Research Volume 4, Issue 8, 1521-1544, ISSN 2277– 7105, 2015. 8. Sangappa K Ganiger, Chaluvaraju B V, Revanasiddappa M and Murugendrappa MV “Synthesis, characterization and current study of polypyrrole/sodium metavanadate (ceramics) nano composites” Advances in Polymer Science and Technology: An International Journal 2015; 5(1): 1-6. 9. Anil Kumar M R, Shanmukhappa S, Rangaswamy B E and Revanasiddappa M “Synthesis, Characterization, Antimicrobial Activity, Antifungal Activity and DNA Cleavage Studies of Transition Metal Complexes with Schiff Base Ligand” International Journal of Innovative Research in Science, Engineering and Technology, Vol. 4(2), 2015:60-66. 10. D SiddalingaSwamy M. Revanasiddappa, and S.C. Raghavendra and Y.T. Ravikiran “Broad Band Electromagnetic Interference (EMI) Shielding Properties of Polyaniline/PVA/MnO2/ Fly ash free standing films” Journal of advances in Physics Vol .6, No. 3 pp 1245-1250, 2014. 11. M. Revanasiddappa, D SiddalingaSwamy and S.C. Raghavendra and Y.T. Ravikiran “Microwave Absorption, Reflection and EMI Shielding Effectiveness of Polyaniline/ Pva-FlyAsh Composites Free Standing Thin Films” Volume III, Issue XI, November 2014, PP1-3, IJLTEMAS. 13. D Smita Revankar,, Jyoti C Ajbani,, M. Revanasiddappa, M Veerabhadra Swamy and S Shankar “Synthesis, Characterization, and Biological Studies on Riluzole Schiff base Metal Complexes” Journal of Applicable Chemistry, 2014, 3 (4): 1447-1459. 14. Sangappa K Ganiger, Chaluvaraju B V, Revanasiddappa M, and Murugendrappa MV “Synthesis, Characterization and A.C. Conductivity Study of Polypyrrole/Sodium Metavanadate(Ceramic) Composites” Volume III, Issue VI, pp 93-97, June 2014 IJLTEMAS. 15. Prasanna B P, Avadhani D N, Muralidhara H B, and Revanasiddappa M “Synthesis, Characterization and Enhanced Dielectric Constant of Polyaniline-Exfoliated Graphite Flakes Composites” Volume III, Issue V, pp, 55-60, May 2014 IJLTEMAS. 16. K.A. Vijayalakshmi, K.Vanitha, M.Revanasiddappa and S.C. Raghavendra “Structural and Morphological Study of Interfacial Polyanilne / FA / Ag Nano composites using by DC Glow Discharge Plasma” International Journal of Science and Research (IJSR), ISSN (Online): 2319-7064, 2014, pp32-34. 17. D. Nagesa Sastry, M. Revanasiddappa, C. Basavaraja, T. Suresh and S.C. Raghavendra “Electrical Conductivity Studies of Doped Polyaniline Molybdenum Oxide Nano Composites” International Journal of Material Sciences and Technology pp. 41-48, 3, 2013. 18. Mohana Lakshmi, Aashish S. Roy, Syed Khasim, Muhammad Faisal,K. C. Sajjan, and M. Revanasiddappa “Dielectric property of NiTiO3 doped substituted ortho-chloropolyaniline composites AIP ADVANCES 3, 112-113 (2013). 21. C. Basavaraja, P.X. Thinh, Won Jung Kim, M. Revanasiddappa, Do Sung Huh “Microstructural and Microwave Shielding Characteristics of Water-Soluble Polypyrrole–Polyvinyl Alcohol–Graphite Oxide Core–Shell Nanocomposites’, Polymer Composites, pp 1534-1540, 10, 2012. 22. Syed Khasim, S C Raghavendra1, M Revanasiddappa, K C Sajjan3, Mohana Lakshmi and Muhammad Faisal “Synthesis, characterization and magnetic properties of polyaniline/γ-Fe2O3 composites” Bull. Mater. Sci., Vol. 34, No. 7, December 2011, pp. 1–5. 23. C. Basavaraja, Na Ri Kim, Eun Ae Jo, M. Revanasiddappa, and Do Sung Huh “Morphology of the Conducting Poly-N-vinylcarbazole-coated Silica Gel Nanocomposites” Bull. Korean Chem. Soc. Vol. 31, No. 2 1, 2010. 25. T Suresh, , N M Kottureshwara M Revanasiddappa and Suresh “ Physico-Chemical Characcteristics of Borewell Water of Bellary Taluk , Karnataka, India” J Nature Environment and Pollution Technology, Vol. 8,No.3, pp 417- 428, 2009. 26. T Suresh, , N M Kottureshwara and M Revanasiddappa “Assessment of Groundwater Quality in and Around Bellary city of Karnataka, India” J Nature Environment and Pollution Technology, Vol. 8,No.4, pp 683- 692, 2009. 27. Revanasiddappa, C Basavaraja, T Suresh and S D Angadi “Synthetic, spectral and antimicrobial activity studies of first row transition metal complexes derived from lansoprazole drug” J. Indian Chem.Soc., Vol 86, 127-132, 2009. 28. M Revanasiddappa, T Suresh, Syed Khasim, S C Raghavendra and S D Angadi, “Transition Metal Complexes of 1, 4 (2-Hydroxyphenyl -1-yl) Diimmino Azine , Synthesis, Characterization and Antimicrobial Studies” E-J.Chem, Vol 5(2), pp 395-403, 2008. 29. Suresh, Padaki Srinivas, T Suresh, N M Kottureshwara and M Revanasiddappa “Studies on Metal ligand stability constants of Diazepines and Benzoazepines with some transition metal ions in aqueous media” J.Ind.Council Chem, vol. 25,No.2, 68-70, 2008. 30. C. Basavaraja, Y. Veeranagouda, Kyoung Lee, R. Pierson, M. Revanasiddappa, and Do Sung Huh “The Study of DC Conductivity for Polyaniline-polymannuronate Nano Composites” Bull. Korean Chem. Soc. 2008, Vol. 29, No. 12, 2423. 31. S. Manjunath, Koppalkar R.Anilkumar, M. Revanasiddappa and M.V.N. Ambika Prasad, “Frequency-Dependent Conductivity and Dielectric Permittivity of Polyaniline/TiO2 Composites” Ferroelectric Letters Section, Taylor & Francis, Vol 35(1&2), pp 36 - 46, 2008. 32. Ameena Parveen, Koppalkar Anil Kumar, Revanasiddappa M, Ekhilikar Shrikant, Ambika Prasad, M.V.N “Dielectric Spectroscopy of Pani-CaTiO3 Composites” Ferroelectrics, Volume 377, Number 1, 2008 , pp. 63-74(12), Taylor and Francis. 33. T. Suresh, S. Santosh Kumar, N.M. Kottureshawara, Syed Khasim, M.Revanasiddappa and Suresh “Spectrophotometric Study of Adducts of Nickel (II)-4- methyl-8–quinolinate with Nitrogen Bases” E-J.Chem, Vol 5(2), pp 404-408, 2008. 34. Suresh, Padaki Srinivas, T.Suresh, M.Revanasiddappa and Syed Khasim “Synthetic, Spectral and Thermal Studies of Tin(IV) Complexes of 1, 5-Benzodiazepines” E-J.Chem, Vol 5(3), pp 627-633, 2008. 35. M. Revanasiddappa, Syed Khasim, S. C. Raghavendra, C. Basavaraja, T. Suresh and S D Angadi “Electrical Conductivity Studies on Co(II), Cu(II),Ni(II) and Cd(II) Complexes of Azines” E-J.Chem, Vol 5(4), pp 797-801, 2008. 36. Shantala D Patil, S C Raghavendra, M Revanasiddappa, P Narsimha and M V N Ambika Prasad, “Synthesis, transport and dielectric properties of polyaniline/Co3O4 composites” Bull. Mater. Sci., 30(2), April 2007, pp. 89–92. 37. M Revanasiddppa and S D Angadi, “Biological evaluation of Some Lansoprozole drug Metal Complexes”, J.Chemtracks, 9(1), pp 13-16, 2007. 38. Syed Khasim, S. C. Raghavendra, M. Revanasiddappa and M. V. N. Ambika Prasad, “Synthesis, characterization and -Femagnetic properties of polyaniline/2O3 composites” Polymer International, UK (Communicated).2007. 39. T Suresh , Hirem ath Suresh Babu, Suresh and M Revanasiddppa, “Evaluation of stability constants of lansoprozole drug with Copper(II), Cobalt(II), Nickel(II), Zinc(II), Cadmium (II) amd Mercury (II)” J.Ind.Council Chem, vol. 24, No. 1,2007. 40. C. Basavaraja, Y.M. Choi, H. T. Park, D. S. Huh, M. Revanasiddappa, T. K. Vishnuvardhan, S. C. Raghavendra and S. Khasim, “ Synthesis, Characterization and low frequency a.c conduction of polypyrrole – lead titanate composites” Bull. Korean Chem. Soc., Vol. 28, No. 7, 2007. 41. Narsimha Parvatikar, Shilpa Jain, Syed Khasim, M. Revansiddappa,S.V. Bhoraskar, M.V.N. Ambika Prasad “Electrical and humidity sensing properties of polyaniline/WO3 composites” Sensors and Actuators 114(2006), 599-603. 43. Syed Khasim, S.C. Raghavendra, M. Revanasiddappa and M V N Ambika Prasad, “Synthesis, characterization and ferroelectric properties of polyaniline/ BaTiO3 composites” Integrated Ferroelectrics, Taylor & Francis, London, vol,325, pp 111-119 2005. 44. S. C Raghavendra, Syed Khasim, M.Revanasiddappa, M.V.N.Ambika Prasad and A B Kulkarni, “Synthesis, characterization and low frequency conduction of polyaniline/flyash composites” Bull. Mater. Sci., Vol. 26, No. 7, December 2003. 45. M.Revanasiddappa, N.N.Mallikarjuna, K.Siddppa and S.D.Angadi, “Studies on VO(II) and ZrO(II) Complexes of Schiff bases derived from ninhydrin and mono amines” Orient.J.Chem., 18(3), 567-70, 2002. 2. Keerthana D, Lakshmi S and Revanasiddappa M “Journey on Space Radiation, a case Study” A Case Study was presented in National conference on Recent Innovation in Science and Engineering, held at PESIT, Bangalore South Campus, Bangalore during 30th April 2016 . 3. Surendar, .and Revanasiddappa, M. “Recent Advancements in the Lithium Ion Based Batteries” A Case Study was presented in National conference on Recent Innovation in Science and Engineering, held at PESIT, Bangalore South Campus, Bangalore during 30th April 2016 . 4. Mohit Sancheti and Revanasiddappa M “Relevance of Renewable Energy Sources in India” A Case Study was presented in National conference on Recent Innovation in Science and Engineering, held at PESIT, Bangalore South Campus, Bangalore during 30th April 2016 . 7. Gnana Tejesh M, Harikrishna Reddy L, Bhavesh C and Revanasiddappa M, “Fatigue Failure in Air Crafts” A Case Study was presented in National conference on Recent Innovation in Science and Engineering, held at PESIT, Bangalore South Campus, Bangalore during 30th April 2016 . 8. Brunda V and Revanasiddappa M “Microbial Fuel Cell: Methodology and Technology to Treat Waste Water and Power Generation” A Case Study was presented in National conference on Recent Innovation in Science and Engineering, held at PESIT, Bangalore South Campus, Bangalore during 30th April 2016 . 9. Anirban Samanta, Ashish Nair and Revanasiddappa M “An Analysis of Nano IC Engines (Nie), Its Applications and Proposed Heat Escape Technology” A Case Study was presented in National conference on Recent Innovation in Science and Engineering, held at PESIT, Bangalore South Campus, Bangalore during 30th April 2016 . 10. Ankitha Sushma, Gopi Chandana and Revanasiddappa M, “Understanding Smart Cities: An Integrating Framework” A Case Study was presented in National conference on Recent Innovation in Science and Engineering, held at PESIT, Bangalore South Campus, Bangalore during 30th April 2016 . 11. Akshaya S and Revanasiddappa M “Electricity from Man Power” A Case Study was presented in National conference on Recent Innovation in Science and Engineering, held at PESIT, Bangalore South Campus, Bangalore during 30th April 2016 . 12. Anwesh Anjan Patel and Revanasiddappa M “Developments in Electro-catalyst For Hydrogen Fuel Cells” A Case Study was presented in National conference on Recent Innovation in Science and Engineering, held at PESIT, Bangalore South Campus, Bangalore during 30th April 2016 . 13. Komal Kumar B.N, Prajwal.G, Prateek .J.P, Karthik. J and Revanasiddappa M “Studies of Mechanical Properties on Epoxy Nanoclay/Fly Ash Reinforcement Polymer Composites” A Case Study was presented in National conference on Recent Innovation in Science and Engineering, held at PESIT, Bangalore South Campus, Bangalore during 30th April 2016 . 14. Ketan Pandit, Muhammad Faisal and Revanasidappa M “Laser power beaming: Novel method for wireless power transmission” A Case Study was presented in National conference on Recent Innovation in Science and Engineering, held at PESIT, Bangalore South Campus, Bangalore during 30th April 2016 . 16. Manoj V, Naveen Kumar A and Revanasiddappa M “EMF pollution – In and Around Bangalore Region” was presented orally in the National conference on Recent Advances and Applied Science, held at AMC Engineering College, Bangalore on 25th April 2016. 17. Ankitha Sushma, Gopi Chandana and Revanasiddappa M “Creating Lead Poisoning Awareness in and around Bangalore” was presented orally in the National conference on Recent Advances and Applied Science, held at AMC Engineering College, Bangalore on 25th April 2016. 19. Nithin Kumar N, Siddesh Chincholi, Preran R Hegde, Shivagiri S Y, Revanasiddappa M and Azharuddin Kazi “Effect Of Acetone & Ethanol Solvent On Flyash/Wooden Fiber Reinforced Epoxy Resin Polymer Composite” was presented in National Conference on “Make In India –An Opportunity For Emerging Engineering Technologies” Organized by S.G.Balekundri, Institute of Technology From 5th - 6th Feb 2016. 20. Abrar Shaik and Revanasiddappa M “Futuristic Materials based on Carbon Nanotubes for Defence Applications” A Case Study was presented in National conference on Recent Innovation in Science and Engineering, held at PESIT, Bangalore South Campus, Bangalore during 2nd may 2015 . 21. Bhaskar K and Revanasiddappa M “Analysis Of Space Radiation, Its Sources And Effects On Human Health and Sensitive Devices” A Case Study was presented in National conference on Recent Innovation in Science and Engineering, held at PESIT, Bangalore South Campus, Bangalore during 2nd may 2015 . 22. Rakesh M, Pramiti J, Rashmi Raghunath and Revanasiddappa M “An Effective Method for Crop Monitoring Using Wireless Sensor Network” A Case Study was presented in National conference on Recent Innovation in Science and Engineering, held at PESIT, Bangalore South Campus, Bangalore during 2nd may 2015 . 23. Aditya D K, Bhavanish Telkar, Ashwin Samuels, Aman Sodera and Revanasiddappa M “Lead Poisoning the Future of Lead’s Impact Threatening on Our Society” A Case Study was presented in National conference on Recent Innovation in Science and Engineering, held at PESIT, Bangalore South Campus, Bangalore during 2nd may 2015 . 25. Janani T, Deepika N, Anuja Halyal, Kaja Venkata Sai Shravan and Revanasiddappa M “Survey on Environmental EMF Pollution” A Case Study was presented in National conference on Recent Innovation in Science and Engineering, held at PESIT, Bangalore South Campus, Bangalore during 2nd may 2015 . 26. Aditya G, Sathvik A S, Kakumanu Venkata Sai Sumanth, Grandhi Pavan Kumar, Alfhan, Pradeep Raja K P and Revanasiddappa M “Spatial Analysis of Groundwater Quality Using GIS System in Jnanabharathi Ward.No 129, Bangalore, Karnataka state, India” A Case Study was presented in National conference on Recent Innovation in Science and Engineering, held at PESIT, Bangalore South Campus, Bangalore during 2nd may 2015 . 27. Pramiti J, Rashmi Raghunath and Revanasiddappa M “Robotics: A Boon or a Bane” A Case Study was presented in National conference on Recent Innovation in Science and Engineering, held at PESIT, Bangalore South Campus, Bangalore during 2nd may 2015 . 28. M. Revanasiddappa, Jyothi C Ajbani, D Smitha REvankar, S C Raghavendra and H Mallikarjun “Microwave Assisted Synthesis, Characterization and biological studies of Cu (II), Co (II), Ni (II), Mn (II), Fe (II), Cr (III), Zn (II), Cd (II), Hg (II), ZrO (II), and VO (II) complexes with Amoxicillin Trihydrate-2-naphthaledine Schiff base” two days Science and Technology conference on Science and Society during 16- 17 January 2015, held at Veerashaiva College Ballari. 29. M Revanasiddappa, D Nagesa Sastry, C Basavaraja, T. Suresh, S.C. Raghavendra H Mallikarjun “Effect of MoO3 nano particles on electrical conductivity Studies of Doped conducting polymer composites”two days Science and Technology conference on Science and Society during 16- 17 January 2015, held at Veerashaiva College Ballari. 30. M Revanasiddappa, T Suresh and H Mallikarjun “Transition metal complexes of Azine derivatives containing Oxygen and Nitrogen donor atoms” two days Science and Technology conference on Science and Society during 16- 17 January 2015, held at Veerashaiva College Ballari. 31. M Revanasiddappa, T Suresh and H mallikarjun “Solid state Electrical conductivity studies on first Row Transition Metal Complexes of Azines” two days Science and Technology conference on Science and Society during 16- 17 January 2015, held at Veerashaiva College Ballari. 35. Revanasiddappa M, Vinay J, Snigdha Reddy K, Snigdha Ran Panda, Vishnu S and Vishruth D “A diagnostic tool using piezoelectric sensor with microcontroller” two days national conference on Innovative Research Materials during November 14-15th 2014, held in Christ college Bangalore. 38. M. Revanasiddappa, D. Nagesa Sastry, T. Suresh and S.C. Raghavendra “Synthesis, Characterization Electromagnetic Shielding Interference and low frequency AC conduction of doped Polyaniline / Molybdenum oxide nano composites” Presented in 6th Bangalore Nano held at Bangalore during 4th – 6th December 2013.(Poster). 41. D Smita Revankar, Jyoti C Ajbani, M. Revanasiddappa and Veerabhadra Swamy “Microwave assisted synthesis, structural elucidation and biological significance of 6(trifluromethoxy) benzothiozole-2- amine derived 2-hydroxynaphthaldehyde and their first row d-transition metal chelates” International Union of Materials Research, Materials Research Society of India, held at IISC, Bangalore during 16th – 20th December 2013, (IUMRS-ICA )(Poster). 42. Mini V, Archana K, Raghu S, Subramanya K, Sharanappa C, Revanasiddappa M and Devendrappa H “ Dielectric study of polyaniline-nano clay composites” International Union of Materials Research, Materials Research Society of India, held at IISC, Bangalore during 16th – 20th December 2013, (IUMRS-ICA )(Poster). 44. M. Revanasiddappa, D Siddalinga Swamy and S C Raghavendra “Microwave Absorption, Reflection and EMI Shielding Effectiveness of Polyaniline/PVA-Fly Ash Composites Free Standing thin” in Indo-Canadian Symposium on Nano-Science and Technology, NIE, held at Mysore February 20-22, 2013 (ICSNST) Oral. 45. D Smita Revankar, Jyoti C Ajbani, M. Revanasiddappa, Veerabhadra Swamy and T. Suresh “Synthesis, Characterization and Biological Studies On 6(trifluromethoxy) benzothiozole-2- amine Schiff base With Cu(II), Co(II), Ni(II), Mn(II), Fe(II), Cd(II), Hg(II), Zn(II), ZrO(II) and VO(II) Metal Complexes” National Conference on Frontiers and Challenges in Biological Organometallic Compounds, held at MSRIT, Bangalore, 20-21st June, 2013 (Poster) . 46. Jyoti C Ajbani, D Smita Revankar, M. Revanasiddappa, Veerabhadra Swamy and T. Suresh “Microwave Assisted Synthesis, Spectral Characterization and Biological Activity of Riluzole Schiff Bases with Transition Metal ion Complexes” National Conference on Frontiers and Challenges in Biological Organometallic Compounds, held at MSRIT, Bangalore, 20-21st, June 2013 (Poster) . 47. Revanasiddappa M, Abhishake Raina, Nithesh N and Raghavendra S C “ Power Generation and Simultaneous Water Treatment from Microbial fuel cell” in 3rd International Conference On Recent Advances in Material Processing Technology (RAMPT’13) held at Kovilpatti, Tamilnadu 6-8th January, 2013 Oral. 48. Revanasiddappa M, Partha G V, Anup K M and Raghavendra S C “Fabrication of Agriculture Sensor” in 3rd International Conference on Recent Advances in Material Processing Technology (RAMPT’13) held at Kovilpatti, Tamilnadu 6-8th January, 2013. (Got Second Prize for Presentation), Oral. 49. Revanasiddappa M, Siddalinga Swamy D, and 2Raghavendra S C "Electromagnetic Interference (EMI) Shielding Applications of MnO2 Nano particles Dispersed in free standing thin film Conducting Polyaniline/ Polyvinyl Alcohol / Fly ash Nanocomposites" in 5th Bangalore Nano held at Bangalore durin 6th – 7th December 2012.(Poster). 50. D. Nagesa Sastry, M. Revanasiddappa, C. Basavaraja, T. Suresh and S.C. Raghavendra “Electrical Conductivity Studies of Doped Polyaniline Molybdenum Oxide Nano Composites” in National Level Seminar on Synthesis, Characterization, Properties and Application of Novel Materials to be held at Christ University, Bangalore, during 30th-31st August 2012 accepted for poster presentation. 51. D. Nagesa Sastry, M. Revanasiddappa, C. Basavaraja, T. Suresh and S.C. Raghavendra “Electromagnetic Interference Shielding Effectiveness of New Conducting Polymer Composite” was presented in International Conference on Recent Advances in Materials Science (RAMS-2012), Bangalore, during 6th – 8th November 212 accepted for oral presentation. 52. Revanasiddappa M, Mini V and Raghavendra S C “Synthesis Characterization and Electrical Conductivity Studies on Polyaniline / Nano clay Composites” was presented in International Conference on Recent Advances in Materials Science (RAMS-2012), Bangalore, during 6th – 8th November 2012 accepted for poster presentation. 53. D. Nagesa Sastry, M. Revanasiddappa, S C Raghavendra, T. Suresh, and M V Murugendrappa “Synthesis Characterization and DC Conductivity Studies of Doped Polyaniline Tungsten Oxide nano Composites” was presented in International Conference on Recent Advances in Materials Science (RAMS-2012), Bangalore, during 6th – 8th November 2012 accepted for poster presentation. 54. Jyoti C Ajbani, D Smitha Revankar, M. Revanasiddappa, S C Raghavendra and T. Suresh “Microwave Assisted Synthesis and Characterization of Schiff Base Metal Complexes Cu (II), Co (II), Ni (II), Mn (II) and Fe(III) Derived from Amoxicillin Trihydrate with Salicyaldehyde” was presented in International Conference on Recent Advances in Materials Science (RAMS-2012), Bangalore, during 6th – 8th November 2012 accepted for poster presentation. 55. D Smitha Revankar, Jyoti C Ajbani, M. Revanasiddappa, Veerabhadra Swamy and T. Suresh “Microwave Assisted Synthesis and Characterization of Salicylidinamoxiciline Complexes of Zn(II), Cd(II) and Hg(II)” was presented in International Conference on Recent Advances in Materials Science (RAMS-2012), Bangalore, during 6th – 8th November 2012 accepted for poster presentation. 56. Revanasiddappa M, Prasanna D R and Raghavendra S C “Synthesis of Silver Nanoparticles with Tinospora Cordifolia and Costus Igneus Plant Extracts” in 4th Bangalore Nano held at Bangalore durin 8th – 9th December 2011.(Poster). 57. B P Prasanna, M Revanasiddappa and H M Suresh “Synthesis Characterization and Transport Properties of Polypyrrole and Strontium Titanate Composites” was presented in National Conference on Recent Trends in Chemical and Environmental Sciences (NCRACES) during 28th – 29th Dec 2011. Fly Ash”, 2011 World of Coal Ash (WOCA 2011), Marriott Tech Center, Denver, Colorado, USA on May 9-11, 2011. 59. Varsha M. Naivedya H, Rekha B U, Bhavani H, Revanasiddappa M, M Faisal and Raghavendra S C, “Effect of magnetic properties of substrates on microstrip antennae parameters” was presented in Joint Int. Conf. on Advanced Materials, ICAM-2011, 19-20 Aug. 2011, BTL Inst. of Tech., Bangalore. 60. Raghavendra S C, Muhammad Faisal and Revanasiddappa M, “Ku-band EMI shielding behavior of polyaniline-barium ferrite composites”, Joint Int. Conf. on Advanced Materials, ICAM-2011, 19-20 Aug. 2011, BTL Inst. of Tech., Bangalore. 61. Nagesa Sastry D, Revanasiddappa M, Basavaraja C, Suresh T and Raghavendra S C, “DC conductivity studies of doped polyaniline molybdenum oxide nano composites”, was presented Joint Int. Conf. on Advanced Materials, ICAM-2011, 19-20 Aug. 2011, BTL Inst. of Tech., Bangalore. 62. Siddalinga Swamy, Revanasiddappa M , Raghavendra S C, Basavaraja C, Muhammad Faisal, “Electromagnetic interference shielding properties of ag dispersed polyaniline / polyvinyl alcohol / fly ash films”, was presented in Joint Int. Conf. on Advanced Materials, ICAM-2011, 19-20 Aug. 2011, BTL Inst. of Tech., Bangalore. 63. Nagesa Sastry D, Revanasiddappa M, Raghavendra S C, Suresh T Amshumali and Basavaraja C “Synthesis and Characterization of Dopped Ployaniline Tungustun Oxide Nano Composites” was presented in National Conference on Chemistry of Materials (NCCM – 2011) held at Tumukur Unversity, Tumkur, during 28th September 2011. 64. D Siddalinga Swamy, Muhammad Faisal S C Raghavendra, M Revanasiddappa and C Basavaraja “Broad band Electromagnetic Interference (EMI) Ehielding Properties of Polyaniline/ Polyvinyl alcohol / Fly ash films” was presented in Nat. Conf. on Recent Trends in Materials Chemistry and Engg (RTMCE - 2011), RNSIT, Bangalore, 29th – 30th Sept. 2011. 65. Anil Kumar M R, Revanasiddappa M, Shanmukhappa S and Rangaswamy B E “ Synthesis and Characterization of Schiff Base Ligands and their Metal Complexes” National Conference on Chemistry of Materials (NCCM – 2011) held at Tumukur Unversity, Tumkur during 28th September 2011. 66. Muhammad Faisal M Revanasiddappa and Raghavendra S C, Direct Current Conductivity of Synthesized Polyaniline – MnO2 Composites” was presented in National Conference on Chemistry of Materials (NCCM – 2011) held at Tumukur Unversity, Tumkur during 28th September 2011. 67. D Siddalinga Swamy, Muhammad Faisal S C Raghavendra, M Revanasiddappa and C Basavaraja “Broad band Electromagnetic Interference (EMI) Ehielding Properties of Polyaniline/ Polyvinyl alcohol / Fly ash films,” was presented in National Conference on Recent Trends in Materials Chemistry and Engineering (RTMCE - 2011) held at RNSIT, Bangalore, during 29th – 30th September 2011. 68. Nagesa Sastry D, Revanasiddappa M, Basavaraja C, Suresh T and Raghavendra S C “Synthesis and Characterization of Doped Polyaniline Molybdenum Oxide Nano Composites” was presented in UGC Sponsored Two Day National Level Seminar on frontiers in Chemistry during 26th -27th August 2011. 69. Siddalinga Swamy D, , Revanasiddappa M, Raghavendra S C, Basavaraja C, Nagesa Sastry D and Suresh T“Synthesis and Characterization of MnO2 Nano Particles Dispersed in free standing thin film of Conducting Polyaniline / Polyvinyl alcohol” was presented in UGC Sponsored Two Day National Level Seminar on frontiers in Chemistry during 26th -27th August 2011. 70. Suresh T, Kottureshwara N M and Revanasiddappa M, “Quality of Ground Water in Selected Areas of Kudligi Taluk of Bellary District in Karnataka State, India” was presented in UGC Sponsored Two Day National Level Seminar on frontiers in Chemistry during 26th -27th August 2011. 71. S C Raghavendra, M. Revanasiddappa, Muhammad Faisal and P. M. Hadalgi, “EMI Shielding Properties of Polyaniline-Fly ash Composites” was presented in Int. Conf. on Functional Polymers, to be held at NIT Calicut, Kerala, during 28-30 Jan. 2011. (Oral). 80. Syed Khasim, S C Raghavendra, Revanasiddappa M, Md.Faisal and Md.Rafi, “Synthesis, Characterization and Transport Properties of Polyaniline/ γ- Fe2O3 composites” was presented in Int. Conf. on Convergence of Sci. & Tech in Engg. Edu. & Res. A Global Perspective in New Millennium – 2010 (ICSE-2010), Dayanand Sagar Group of Inst. & IEEE Soc. Bangalore, from 23-25 May, 2010 (Oral). 81. Syed Khasim, S C Raghavendra, Revanasiddappa M, M. Lakshmi, Sajjan K C & Md. Faisal, “Electrical Properties of Post-Treated PEDOT-PSS Organic Thin Films” was presented in International Symposium on Materials Chemistry (ISMC-2010) held at BARC-Mumbai during Dec 7-11, 2010. 84. D.Nagesa Sastry, S.C.Raghavendra, C.Basavaraja, T. Suresh and M. Revanasiddappa, “DC Conductivity Studies of Doped Polyaniline Tungsten Oxide nano Composites” was presented in Int. Symp. Research Scholars on Metallurgy, Mater. Sci. and Engg. (ISRS-2010), held at IIT Madras, Chennai during 20-22, Dec. 2010 (Oral). 86. Hiremath Suresh Babu, T Suresh, Suresh and M Revanasiddappa “ Synthesis Characterization and Antimicrobial Studies Cu(II), Co(II), Ni(II), Zn(II), Cd(II) and Hg(II) Complexes with Biologically Active Benzothiazole Schiff base ligands” was presented in National Conference on Recent Trends in Chemical and Biological Sceinces March 30th -31st 2010, Kuvempu University, Shimoga.(Oral). 90. T Suresh, C Suresh, M Revanasiddappa, N M Kottureshwara and Suresh “Synthesis characterization and Biological studies on Drug Metal Complexes” was presented in Two days National Seminar on Chemistry and Molecular Nano Technology for Industry and Society, Kuvempu University, Shimoga, during 16th -17th Jan, 2009. 91. M Revanasiddappa, S C Raghavendra T Suresh and D Nagesh Shastry “Synthesis Characterization and Comparative study of conducting PANI/W2O3 and PANI DBSA/W2O3 Composites” was presented in Two days National Seminar on Chemistry and Molecular Nano Technology for Industry and Society, Kuvempu University, Shimoga, during Jan 16th -17th, 2009. 92. Surya Prasad, Thilak Kumar P R, Rashmi L S, Vinay Yadav R, Mithun Kumar and Revanasiddappa M “Flexible database Security System Using I button access control policies” was presented in A National Conference on Emerging Technology & Application (NCETETA-2009) held at Shiridi Sai Engineering college Anekal on 29th-30th April 2009. 93. M Revanasiddappa, T Suresh and S D Angadi “Synthesis, Characterization and electrical properties of Mn(II) and Fe(III) Complexes with azine ligand” was presented in 27th Annual conference of Indian council of chemists to be held at Gurukul Kangari University, Haridwara during 26th -28th December 2008. 94. M Revanasiddappa, Suresh, S D Angadi and T Suresh “Transition metal Complexes of azine derivetives containing Oxygen and Nitrogen donor atoms” was presented in 27th Annual conference of Indian council of chemists to be held at Gurukul Kangari University, Haridwara during 26th -28th December 2008. 95. T Suresh, N M Kottureshwara, Suresh and M Revanasiddappa “Physicochemical Characteristics of Bore-wells water of Bellary Taluk, Karnataka, India” was presented in Annual conference of Indian council of chemists to be held at Gurukul Kangari University, Haridwara during 26th -28th December 2008. 96. M Revanasiddappa, T Suresh and S D Angadi “Synthesis structural characterization and antimicrobial studies of some divalent metal complexes of 1, 4 (2-Hydroxyphenyl -1-yl) Diimmino Azines” was presented in 26th Annual conference of Indian council of chemists to be held at Banaras Hindu University, Varanasi during 25th -27th December 2007. 97. C. Basavaraja, Young Min Choi, Hyun Tae Park, Do Sung Huh, Jae Wook Lee, T. K.Vishnuvardhan, M. Revanasiddappa, S. C. Raghavendra, and S. Khasim “Characterization and electrical behavior of polyaniline-poly-isopropylacrylamide/alumina aqueous dispersions in the presence of dodecylbenzenesulfonic acid” was presented in 9th International Symposium on Polymers for Advanced Technologies, During 22-25, October 2007 held at Shanghai, China. 98. M Revanasiddappa, T Suresh, Nagesh Shastry and S D Angadi “Synthesis, characterization, electrical and antimicrobial properties of Zn(II), Cd(II) and Hg(II) metal complexes with novel azine ligands” was presented in 26th Annual conference of Indian council of chemists to be held at Banaras Hindu University, Varanasi during 25th -27th December 2007. 99. T Suresh, S Sonthosh Kumar, N M Kottureshwara, Suresh and M Revanasiddappa “Study on adduct formation of nickel(II) chelates of 4-methyl-8-quinolinate with nitrogen bases” was presented in 26th Annual conference of Indian council of chemists to be held at Banaras Hindu University, Varanasi during 25th -27th December 2007. 100. T Suresh, Hiremath Suresh Babu, Suresh and M Revanasiddappa “Evaluation of stability constants of nortriptyline hydrochloride drug with Copper(II), Cobalt(II), Nickel(II), Zinc(II), Cadmium(II) and Mercury(II)” was presented in 26th Annual conference of Indian council of chemists to be held at Banaras Hindu University, Varanasi during 25th -27th December 2007. 101. T Suresh, Hiremath Suresh Babu, Suresh and M Revanasiddappa “Evaluation of stability constants of gabapentine Copper(II), Cobalt(II), Nickel(II), Zinc(II), Cadmium(II) and Mercury(II)” was presented in 26th Annual conference of Indian council of chemists to be held at Banaras Hindu University, Varanasi during 25th -27th December 2007. 102. T Suresh, N M Kottureshwara, M Revanasiddappa, Suresh and Y S Kudupali “Physico-Chemical and biological quality of drinking water in Bellary District,Karnataka” was presented in 26th Annual conference of Indian council of chemists to be held at Banaras Hindu University, Varanasi during 25th -27th December 2007. 103. Sangshetty K, S. C. Raghavendra, M Revanasiddappa, Syed Khasim and M V N Ambika Prasad, “Microwave Shielding Properties of Polyaniline/Dysprosium oxide composites”, was presented in National Conference on Advances in Materials Science (AMS-07), held on 27-28, Jan, 2007 at Gulbarga University, Gulbarga (Poster). 104. T Suresh , Hiremath Suresh Babu, Suresh and M Revanasiddppa, “Evaluation of stability constants of lansoprozole drug with Copper(II), Cobalt(II), Nickel(II), Zinc(II), Cadmium (II) amd Mercury (II)” was presented in National conference on Emerging areas in chemical and biological sciences, (NCEACB-2007) held at Kuvempu University, Shankarghatta during 23rd-24th March 2007. 105. C.Basavaraja, Young Min Choi, Hyun Tae Park, Do Sung Huh M. Revanasiddappa, S.C. Raghavendra, T Suresh and Syed Khasim* “Tranasport properties of polyaniline / flyash composites in acidic medium” was presented in International Conference on Polymeric Materials in Power Engineering (ICPMPE), 4 – 6 Octo 2007,to be held at CPRI, Bangalore , INDIA. 106. Revanasiddappa M Suresh T and Angadi S D “Electrical Conductivity studies on Co(II),Cu(II),Ni(II)Cd(II)Complexes of Azines,”, was presented in National Conference on Advances in Materials Science (AMS-07), held on 27-28, Jan, 2007 at Gulbarga University, Gulbarga (Poster). 107. Ameena Parveen Anil Kumar Koppalkar Revanasiddappa M and M V N Ambika Prasad, “Synthesis and electrical properties of polyaniline/ SrTiO3 composites” was presented in National Conference on Advances in Materials Science (AMS-07), held on 27-28, Jan, 2007 at Gulbarga University, Gulbarga (Poster). 108. Manjunath S, Machappa T, M Revanasiddappa, and M V N Ambika Prasad, “Synthesis, characterization and transport properties of Polyaniline / Yettrium oxide composites”, was presented in National Conference on Advances in Materials Science (AMS-07), held on 27-28, Jan, 2007 at Gulbarga University, Gulbarga (Poster). 109. Syed Khasim, S. C. Raghavendra, M Revanasiddappa, and M V N Ambika Prasad, “Ferroelectric and ferromagnetic properties of polyaniline composites” was presented in National Conference on Advances in Materials Science (AMS-07), held on 27-28, Jan, 2007 at Gulbarga University, Gulbarga (Poster). 110. C Basavaraja, Gajanan V Honnavar, M Revanasiddappa, Syed Khasim and S.C. Raghavendra “Radio Frequency Shielding Properties of Polypyrrole – Lead Titanate Composites”, was presented in International Conference on Advanced Materials (IUMRS-ICAM-2007), to be held at IISc, Bangalore during Oct 8-13, 2007. 111. T K Vishnuvardhan, V R Kulkarni, C Basavaraja, Syed Khasim, M Revanasiddappa and S.C. Raghavendra, “Comparative Studies of Frequency Dependent Dielectric and Conductivity Properties of PPY-CeO2 and PPY- La2O3 Composites”, was presented in International Conference on Advanced Materials (IUMRS-ICAM-2007), to be held at IISc, Bangalore during Oct 8-13, 2007. 112. Sangashetty K, Syed Khasim, M Revanasiddappa and S.C. Raghavendra, “Radio Frequency Shielding Properties of Polyaniline and Oxide Composites”, was presented in International Conference on Advanced Materials (IUMRS-ICAM-2007), to be held at IISc, Bangalore during Oct 8-13, 2007. 113. M Revanasiddappa, Syed Khasim, S.C. Raghavendra, C Basavaraja, T Suresh and S D Angadi, “Synthesis Characterization and Electrical Properties Of ZrO(II), VO(II) and Fe(III) Metal Complexes with Azine Ligand”, was presented in International Conference on Advanced Materials (IUMRS-ICAM-2007), to be held at IISc, Bangalore during Oct 8-13, 2007. 115. M V Murugendrappa, M Revanasiddappa and M V N Ambika Prasad “Synthesis, Characterization and DC Conductivity Studies of Polypyrrole – BaTiO3 Composites” Seminar on Advances in Materials Science held at Gulbarga University, Gulbarga, 9Th-10th Jan 2006. 116. S. Manjunath, Syed Khasim, M. Revanasiddappa and M.V.N. Ambika Prasad “Dielectric Spectroscopy of polyaniline / Titanium dioxide composites” Seminar on Advances in Materials Science held at Gulbarga University, Gulbarga, 9th-10th Jan 2006. 117. Sangshetty. Kalyane, Syed Khasim, Narsimha Parvatikar, M. Revansiddappa. Arun Lagshetty and M.V.N. Ambika Prasad. “Conductivity Studies of Polyaniline – Praseodymium Oxide (Pr2O3) Composites” Seminar on Advances in Materials Science held at Gulbarga University, Gulbarga, 9th-10th Jan 2006. 118. Shantala Patil, S C Raghavendra, M Revansidappa, Narsimha Parvatikar, Syed Khasim and M V N Ambika Prasad. “Synthesis, Transport and Dielectric Properties of Polyaniline/Co3O4 Composites”. Seminar on Advances in Materials Science held at Gulbarga University, Gulbarga, 9Th-10th Jan 2006. 119. Suresh T, Hiremath Suresh Babu, Suresh and Revanasiddappa M “Studies on ionization constant of lansoprazole drug and its formation constants with bivalent transition metal ions in water-dioxane medium” was presented in Indian council of chemists silver jubilee conference held at Kalyan(M S) 27th-29th Dec 2006. 120. Shantala D.Patil, Narsimha Parvatikar, Syed Khasim, S.C.Raghavendra, M. Revanasiddappa, and M. V. N. Ambika Prasad “Synthesis, Characterization and Transport Properties of Polyaniline/Co3O4 Composites” was presented in 16th AGM of MRSI and Symposium on " Materials for Automotive Industries " NCL, Pune 10th to 12th Feb.2005. 121. Narsimha Parvatikar, Syed Khasim, Murugendrappa M. V, Sangashetty K, Raghavendra S. C, Revanasiddappa M, M. V. N. Ambika Prasad “Synthesis, Characterization and Transport Properties of Polyaniline Cerium Oxide Composites” was presented in 16th AGM of MRSI and Symposium on " Materials for Automotive Industries " NCL, Pune 10th to 12th Feb.2005. 122. T. K. Vishnuvardhan, V. R. Kulkarni, M. Revanasiddappa. C. Basavaraja, S. C. Raghavendra “DSC Studies and Electrical Conductivity of Polypyrrole/CeO2 Composites” was presented in 16th AGM of MRSI and Symposium on “Materials for Automotive Industries” NCL, Pune 10th to 12th Feb.2005. 123. Murugendrappa M V., Syed Khasim, Narsimha Parvatikar, Sangashetty K., Raghavendra S. C, Revanasiddappa M., M V. N. Ambika Prasad. “DC Conductivity Studies of Polypyrrole Fly Ash Composites” was presented in n16th AGM of MRSI and Symposium on “Materials for Automotive Industries " NCL, Pune 10th to 12th Feb.2005. 124. Revanasiddappa M and Angadi S. D. “DC Electrical Conductivity of Synthesized Azine Metal Complexes” 16th AGM of MRSI and Symposium on Materials for Automotive Industries " NCL, Pune 10th to 12th Feb.2005. 125. Syed Khasim, S. C. Raghavendra, M. Revanasiddappa and M. V. N. Ambika Prasad, “Synthesis, characterization and magnetic properties of polyaniline/g-Fe2O3 composites” was presented in International Seminar on Advances in Polymer Technology, held in CUSAT, Kerala, during Jan 16-17, 2004. 126. Syed Khasim, S.C. Raghavendra, M. Revanasiddappa and M V N Ambika Prasad, “Dielectric Spectroscopy of conducting Polyaniline-BaTiO3 composites” was presented in Asian Meeting of Ferroelectrics (AMF-04), held at IISc, Bangalore from Jan. 19-22, 2004. 127. Vishnuvardhan T.K., Basavaraja C., M. Revanasiddappa, S. C. Raghavendra and Kulkarni V.R., “Synthesis and characterization of polypyrrole / ceric oxide composites” was presented in International Seminar on Advances in Polymer Technology, held at CUSAT, Kerala, during Jan 16-17, 2004. 128. K.Siddappa, M.Revanasiddappa and S.D.Angadi “Binuclear New Complexes of Dioxouranium(VI) and Thorium(VI) with azo ligands” was presented in 91st of the Indian Science Congress held at Chandigarh on Jan, 03-07. 2004. 129. M V Murugendrappa, Syed Khasim M Revanasiddappa and M V N Ambika Prasad. “Synthesis and Conductivity Studies of Polypyrrole – γ –Fe2O3 Composites” was presented in National Conference on Current Trends in Condensed Matter Research to be held at University Arts and Science College, Warangal, AP during 20th to 22nd Sept. 2004. 130. M V Murugendrappa, Syed Khasim, M Revanasiddappa and M V N Ambika Prasad “Synthesis and AC Conductivity Studies of Polypyrrole –BaTiO3 Composites” was presented in XIII National Seminar on Ferroelectrics and Dielectrics held at Department of Physics and Astrophysics, University of Delhi, New-Delhi during 23rd to 25th Nov. 2004. 131. M.Revanasiddappa, S.M.Jogad,Arvind.H.Dyama and S.D.Angadi “Activation energy for some azine metal comolexes” was presented in XIII National Seminar on Ferroelectrics and Dielectrics held at Department of Physics and Astrophysics, University of Delhi, New-Delhi during 23rd to 25th Nov. 2004. 132. M. Revanasiddappa, K.Kashinath, K. Siddappa and S.D. Angadi “.Microbial studies on some metal complexes” 41st Annual Convention of Chemist held at University of Delhi, 24-26th December 2004. 133. M. Revanasiddppa, Sanjay Mulege, K. Siddappaand S .D. Angadi “Studies on Co(II) , Ni(II) and Cu(II) complexes of symmetric aldazine” 23rd Conference of Indian Council of Chemists” held at K.C. College, Church Gate, Mumbai 14 -16th Oct. 2004. 134. S.D. Angadi, Sanjay Anna Rao and M. Revanasiddppa, “Synthesis and characterization of some transition metal complexes derived from Benzo(B) thiopene Schiff bases” was presented in 23rd Conference of Indian Council of Chemists” held at K.C. College, Church Gate, Mumbai 14 -16th Oct. 2004. 135. S C Raghavendra, Syed Khasim, M Revanasiddappa, M V N Ambika Prasad and A. B. Kulkarni, “Low frequency ac conduction in polyaniline – fly ash composites” was presented in 14th Materials Research Society of India Symposium, held at Bhabha Atomic Research Centre, Mumbai, from February 11-13, 2003 (accepted for poster presentation). 136. K.Siddappa, M.Revanasiddappa, S.D.Angadi and R. L.Raibagkar “DC conductivity behavior of oxovanadium (IV) and Tin(IV) complexes with 4-4`-diaminostiblene-2-2`-isulphonate and its derivatives” was presented in 14th Materials Research Society of India Symposium, held at Bhabha Atomic Research Centre, Mumbai, from February 11-13, 2003 (PPO-14). 137. M.Revanasiddappa, K.Siddappa and S.D.Angadi, “Synthesis and Characterization of Metal(II) complexes with Lansoprazole” was presented in 22nd Conference of the Indian Council of Chemists held at Indian Institute of Technology, Roorkee, on 17-19.October, 2003. 138. M.V. Murugendrappa, Syed Khasim, M. V. N. Ambika Prasad, M. Revanasiddappa and S.C. Raghavendra, “Surface morphology and a.c conductivity behaviour of Polypyrrole-Fly ash composites” was presented in DAE-Solid State Physics Symposium 2003, held during Dec 26-30, 2003 at Jiwaji University, Gwalior. 139. M. Revanasiddappa, K.Siddppa R.K.Shikkargol and S.D.Angadi “Synthesis and characterization of Zn(II), Cd(II) and Hg(II) complexes with ninhydrin and monoamino Schiff bases” presented in 28th conference of Indian Council of Chemists 2002. 140. M Revanasiddappa, K.Siddppa and S.D.Angadi, “Studies on Tin(IV) complexes derived from 4,4`-diamino stilbene 2,2`-disulphonate and its derivatives” presented in 28th annual conference of Indian council of Chemists 2002.